Shovels and video games are not a promising combination. In fact, one of the worst catastrophes in the history of electronic games was the Atari game burial, when thousands of unsold games were buried in a landfill. This set a precedent for the term shovelware, which TMTF once defined as “Badly-designed games fit only for taking up space in landfills.” No, shovels and video games don’t mix well. Thanks to one brave little knight, however, that may be changing. Shovel Knight is a game I really wanted to play. Last month, I finally picked it up and played it. Did I unearth a treasure in Shovel Knight, or should I have left it buried? Shovel Knight is a near-perfect blend of responsive controls, challenging level design, retro-styled visuals, and whimsical humor—to wit, I really dig this game. Once upon a time, Shovel Knight and Shield Knight roamed the world in search of treasure and adventure. Tragedy struck, however, when a cursed amulet stole Shield Knight, driving Shovel Knight to a life of grief and solitude. Time has passed. An evil Enchantress has arisen. Her ruthless Order of No Quarter, a band of eight wicked knights, terrorize the land. 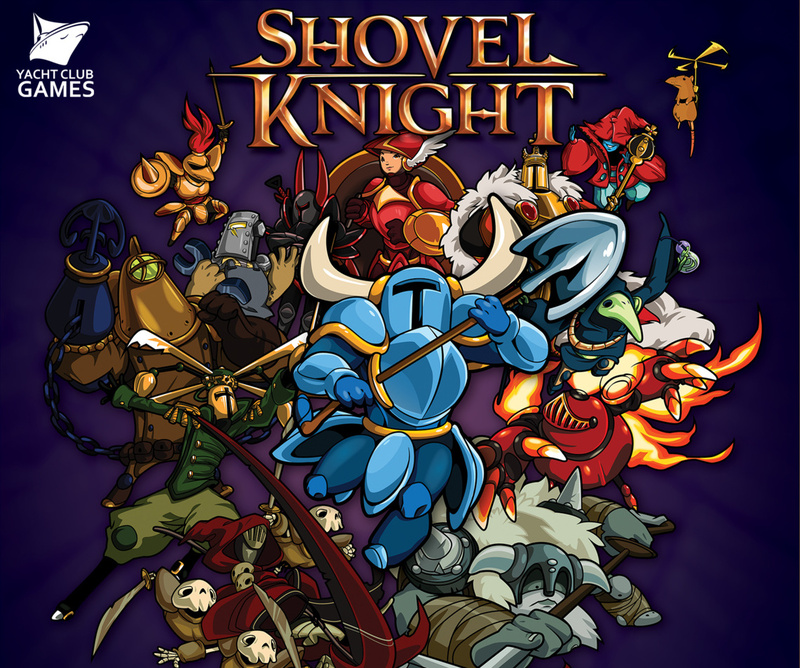 In his quest to find Shield Knight and rescue the realm, Shovel Knight must take up his tool and fight. Shovel Knight, like the Shantae games, is heavily inspired by the games of yore. (Shovel Knight and Shantae have much in common; the same composer and some of the same developers worked on both.) Shovel Knight borrows its level designs and basic gameplay from the Mega Man games, its map from Super Mario Bros. 3, its towns from Zelda II: The Adventure of Link, and one of its moves from that improbably awesome DuckTales game. My point is that Shovel Knight is built on the solid foundation of older games, and that’s a good thing. In fact, it makes me rethink my criticism of Shantae and the Pirate’s Curse for being “awfully familiar.” It’s important to innovate in game development, as in any other creative medium, but there’s also something to be said for perfecting what has been done before. Shovel Knight is built of old parts, but they come together to make something really special. What it lacks in innovation, it makes up in technical excellence. The controls in Shovel Knight are tight and responsive, allowing the eponymous hero to slash, hack, jump, thrust, and bounce with perfect precision. That’s fortunate, for the levels are extremely challenging. The platforming can be tricky; traps, enemies, and obstacles only make things more difficult. I was relieved, however, by how fair the game is. It doesn’t sabotage the player with poor controls, obtuse level design, or deliberate tricks. Shovel Knight can be a hard game, and most players will die a lot, but they’ll have no one but themselves to blame for it. The levels are terrific. They scroll horizontally and vertically, and not a screen is wasted: every room and area has some new challenge, and there are plenty of secrets to find. Visually, the game boasts pixelated, old-timey visuals on the same color palette as the old Nintendo Entertainment System. 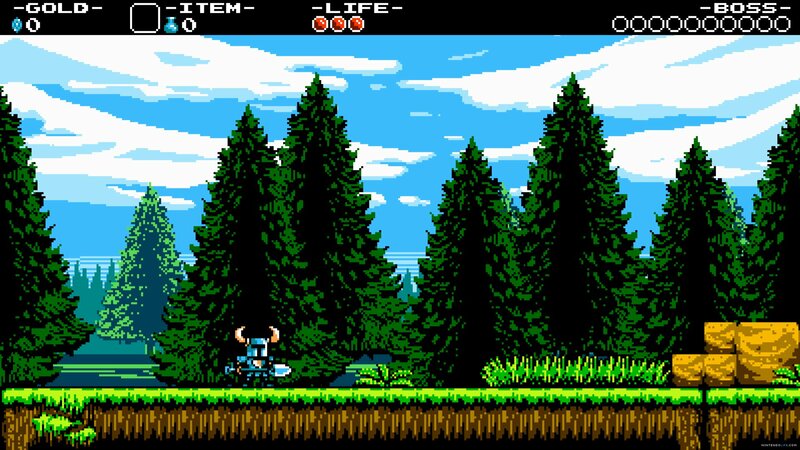 Shovel Knight looks (and plays) like a long-lost NES game, plus a few modern tweaks and minus the bad writing ubiquitous in the old days. Besides his namesake weapon, Shovel Knight wields relics, a wide assortment of weapons and equipment bought from Chester, a wandering merchant who hangs out inside treasure chests (get it?) hidden in most levels. Money can also be used to buy shovel upgrades, new suits of armor, health boosts, and other bonuses. Among other collectibles, Shovel Knight allows players to gather sheets of music that can be exchanged for songs and in-game cash. Speaking of music, the game’s soundtrack is phenomenal in a shrill, electronic sort of way. Seriously, listen to its main theme. If that doesn’t give you feels, you may have no soul. This is normally the part where I criticize a game for its flaws. With Shovel Knight, I have to look really hard. Prepare yourself, dear reader, for Adam at his most hypercritical. There’s not much story in Shovel Knight. It doesn’t need a complex story—the game is tons of fun to play—but more plot and characterization would have been nice. It’s sort of a Super Mario Bros. story: girl is taken, hero must rescue her, etc. There are one or two twists, and the Order of No Quarter are likable enough as characters, but the simplistic story feels like a missed opportunity. Shovel Knight is a pretty short game. I actually appreciated that—I don’t have as much time for video games as I wish I had—but players expecting a long quest may be disappointed by its brevity. Besides its difficulty, which is matter of preference, that’s pretty much everything I can find to criticize in Shovel Knight. …And They Lived Happily Ever After, You Dig? 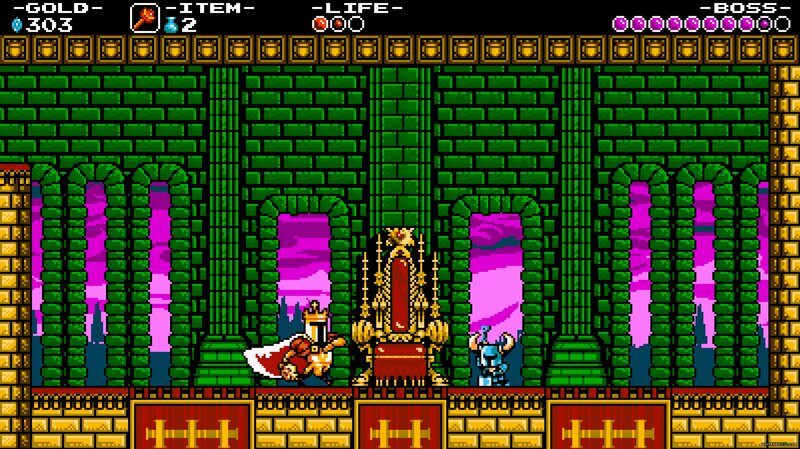 Shovel Knight is a game as pleasant and stalwart as its horned hero. It’s old-fashioned, challenging, and not for everyone; I know a couple of people who don’t much care for it. All the same, I love it, and I recommend it wholeheartedly. The game is a well-written, beautifully-designed, gorgeously-scored love letter to the video games of the eighties. Like those games, Shovel Knight proves you don’t need fancy graphics, elaborate storytelling, or extravagant pageantry to make a game. No, all you need is a shovel and a little courage. This entry was posted in Video Games and tagged game review, music by Adam Stück. Bookmark the permalink.